There was a man called Elkanah who lives in the mountains of Ephraim. Elkanah has two wives who are Hannah and Penninah. Penninah had children; but Hannah was barren and without children. One day, Elkanah and his whole family went up to Shiloh to offer sacrifices to the Lord. Elkanah loves Hannah more than Penninah so he always gives Hannah double portion of meat compare to Penninah. Penninah often laughs at Hannah because Hannah couldn’t have any children. This made Hannah very sad and she cried badly over it and did not eat. Hannah got up after she finished her meal and went up to Eli, the priest. Eli was sitting by the door posts of the tabernacle. Hannah was crying and praying to God at the same time. When Hannah prayed, her lips were moving but no voice can be heard. So Hannah left and she was very happy to hear Eli say that God will answer her prayer. The Lord answered Hannah’s prayer and Hannah was conceived with a son. Hannah gave birth to a son. Hannah called the baby boy Samuel. 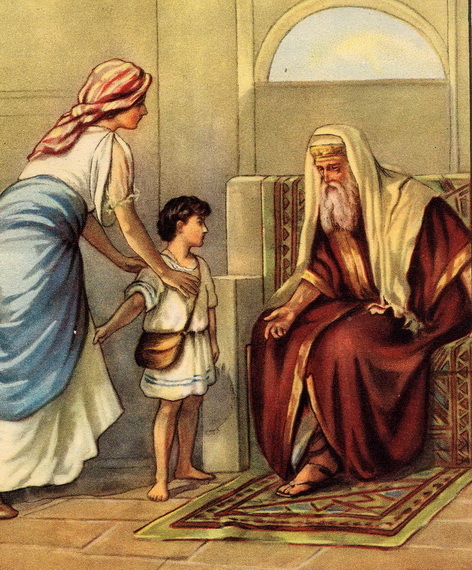 After the time for Hannah to wean Samuel is passed, she brought Samuel to Eli to dedicate him to the Lord. Samuel stayed there at Shiloh with Eli and serve God. God knows the desire of jour heart and he will always answers us lets never give up let us be like hannah who persistedly prayed until she conceived a son .